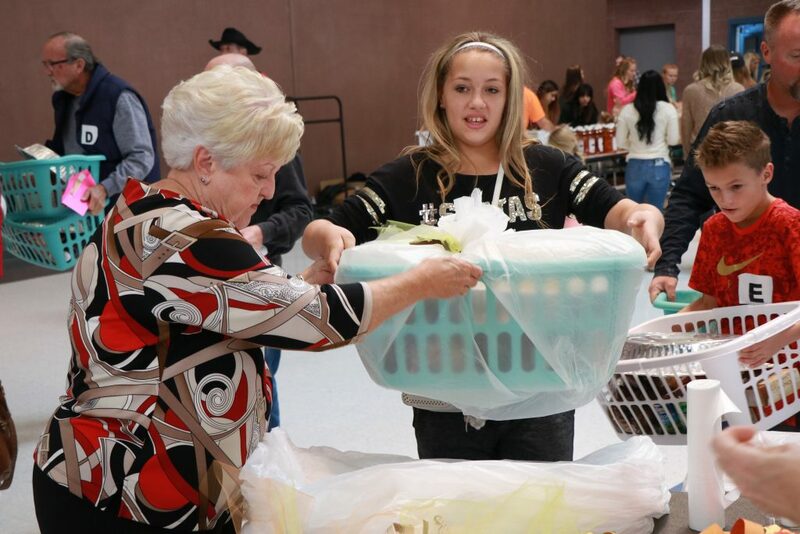 ST. GEORGE — More than 1,200 people received the free food and supplies they needed for a traditional home-cooked meal for Thanksgiving, thanks to dozens of volunteers and generous donors who make up the Basket Brigade of St. George. 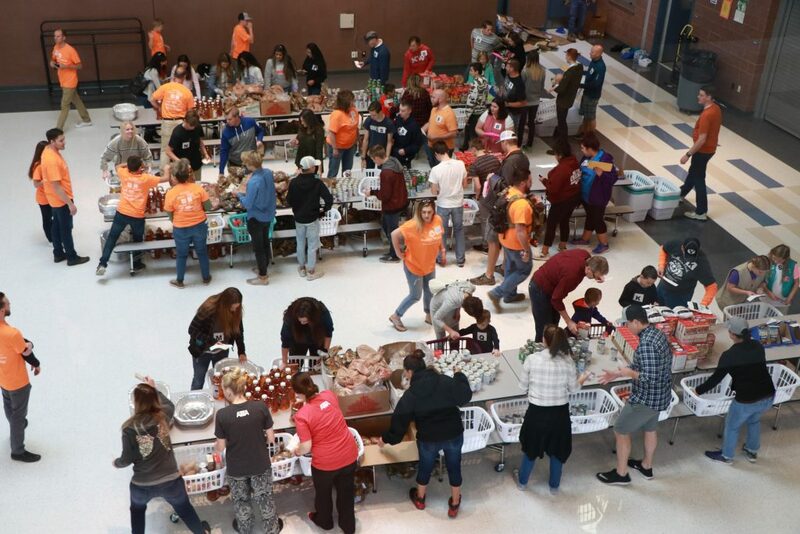 Organizers said a record-breaking 260 baskets were created and delivered this year, the Basket Brigade program’s seventh year of operation locally. Event chairman Jeremy Larkin of the Larkin Group said the event has become so popular that organizers had to turn away volunteers this year. 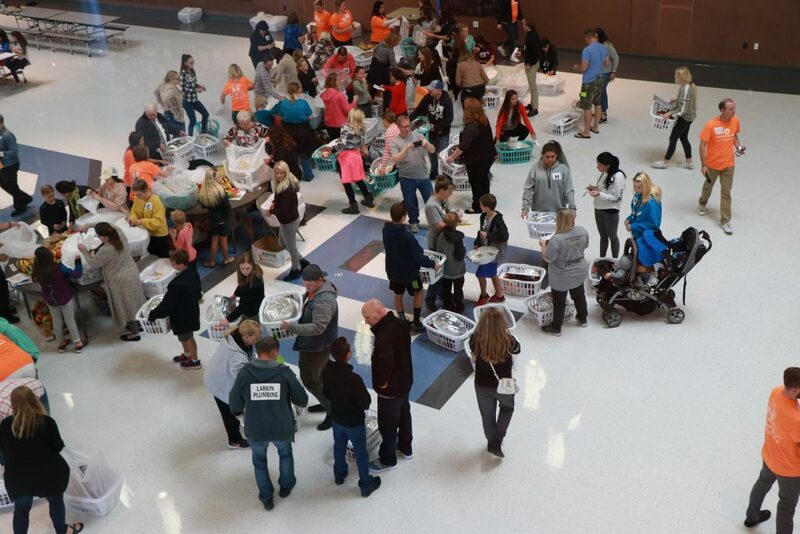 More than 200 volunteers gathered at Dixie Middle School Nov. 18, where they assembled the food baskets to be delivered to local residents in need. Each plastic laundry basket was loaded with just about everything needed for a traditional Thanksgiving dinner, minus the turkey, for which a gift card was included. Handmade centerpieces and gift cards colored by volunteer children topped off each basket. The group had all 260 baskets assembled in less than an hour. Larkin said putting together 222 baskets last year was chaos, but said he and the other organizers worked hard to streamline the process and enable them to help even more families. 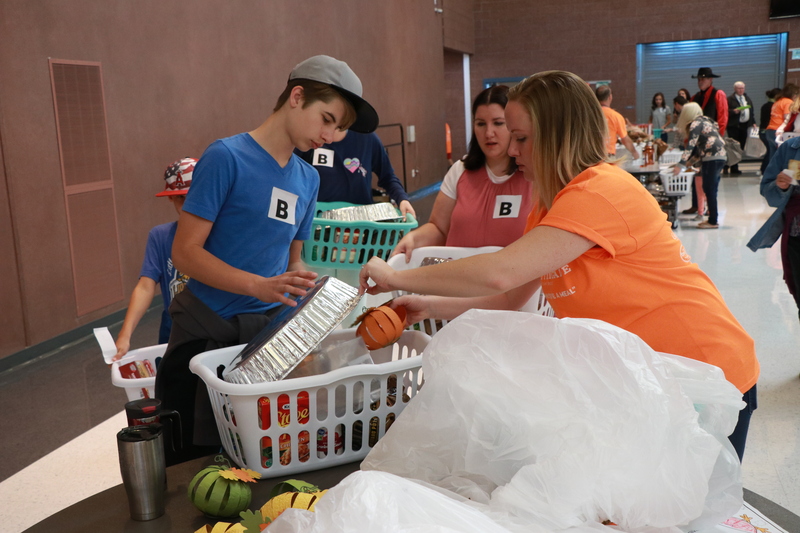 After the baskets were made, the groups of volunteers then got in their cars and delivered the baskets to their designated recipients, each of whom had been nominated anonymously by their friends and neighbors. Money for the baskets came from individual donors, many of whom had contributed electronically via the nonprofit group’s website. A number of local business sponsors also donated money and goods to the campaign. “You just go up to their door and knock, and when they come to the door you hand them the basket and say, ‘Happy Thanksgiving. Somebody loves you,'” volunteer Jessica Hogan said, describing the typical porch delivery experience. 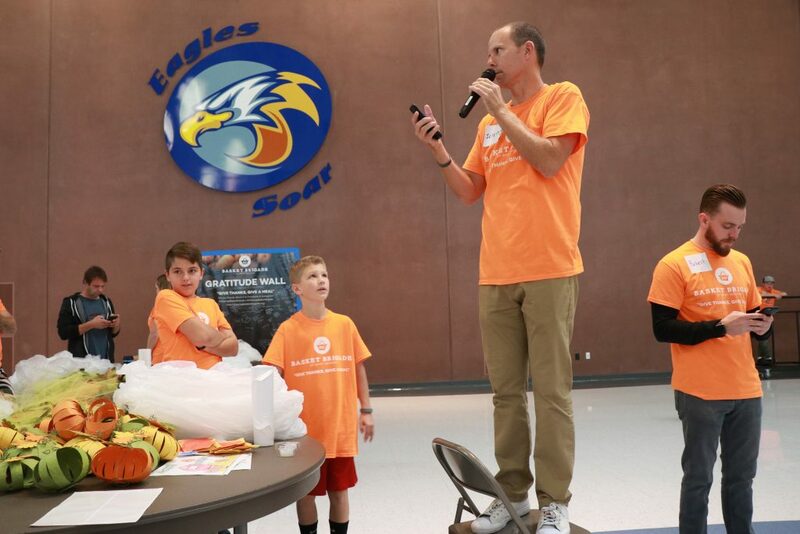 According to the group’s website, Basket Brigade is an event that was initially inspired by motivational speaker Tony Robbins‘ real-life Thanksgiving hunger experience as a child. After having volunteered at a Basket Brigade event in Las Vegas in 2008, members of the Palmer family of St. George started a Basket Brigade in their own hometown a few years later. Last year, the Larkin family took over the event, which is registered as a 501(c)(3) organization, with 100 percent of donations going to the basket recipients, Larkin said, adding that any money left over goes toward follow-up service projects, such as repairing porches or windows, of the families in need, with that work also being performed by volunteers. “The greatest joy is in delivering the basket to the door, knocking and letting someone know that they are loved,” Larkin said. Another popular aspect of Basket Brigade is that it gives recipients a chance to cook the meal on their own and enjoy it with their families. One volunteer family reportedly said that their children’s attitudes have literally changed the morning they showed up to volunteer and were still transformed four days later. I had to say something. I am really appreciative of whomever did this. The preparation, thought, time, money and delivery, and everything else behind the scenes meant a lot to me. I actually had not a lot of food when this was delivered so I was especially touched. Thank you for being so kind.